A reporter investigates the darkest story of his life. His own. Simon & Schuster, 9781416541530, 400pp. Do we remember only the stories we can live with? The ones that make us look good in the rearview mirror? In The Night of the Gun, David Carr redefines memoir with the revelatory story of his years as an addict and chronicles his journey from crack-house regular to regular columnist for The New York Times. Built on sixty videotaped interviews, legal and medical records, and three years of reporting, The Night of the Gun is a ferocious tale that uses the tools of journalism to fact-check the past. Carr’s investigation of his own history reveals that his odyssey through addiction, recovery, cancer, and life as a single parent was far more harrowing—and, in the end, more miraculous—than he allowed himself to remember. Fierce, gritty, and remarkable, The Night of the Gun is “an odyssey you’ll find hard to forget” (People). David Carr was a reporter and the “Media Equation” columnist for The New York Times. Previously, he wrote for the Atlantic Monthly and New York magazine and was editor of the Twin Cities Reader in Minneapolis. The author of the acclaimed memoir, The Night of the Gun, he passed away in February 2015. "[A] fierce, self-lacerating tale....writing full of that special journalistic energy that is driven by a combination of reporting and intelligence." "[A] remarkable narrative of redemption...He writes with grace and precision...With grit and a recovering user's candor, Mr. Carr has written an arresting tale..."
"3 stars. It's an odyssey you'll find hard to forget." "The Night of the Gun is about as dark and murky as dark and murky get. And though it is one of the most eloquent accounts of the seduction and snare of addiction, what's gotten lost in the water-cooler discussion about Carr's misadventures -- including drug peddling as well as his bout with cancer -- is that this book, in its sharp, serrated prose, is a meditation on how memory works (but mostly how it doesn't), a man's obsessive effort to get at his life's true narrative using the skills he's honed as a reporter, the one piece of his life that didn't combust." "After years of abuse, the memoir has found its white knight, galloping in to show how a personal story can be engrossing, shocking and true. Mr. Carr's book...practically issues a challenge to thosecurrent reigning kings -- David Sedaris, Augusten Burroughs, Ishmael Beah -- of the memoir genre: You get a video camera and tape recorder, and retrace the steps of your life. Will your story sound the same?...It adds up to a riveting, improbable story. More important, Mr. Carr has produced a work that stands to revive the excitement and thrill of reading about reporting. It's All the President's Men, but about a dude from Minnesota with a drug habit." 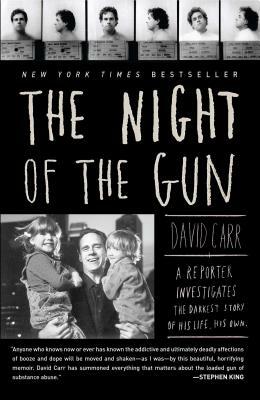 "There may be no memoirist who has more skillfully used journalistic tools to reconstruct his own life than New York Times media columnist David Carr in his remarkable and harrowing book, The Night of the Gun....A." "The Night of the Gun is in part a writerly exercise in defense and disarmament--memoir in the throes of an existential crisis. But that does not prevent it from being a great read. This is largely because, in using his reporter's chops to investigate his own past, Carr taps the very skills that propelled him to survive. His method, as much as his madness, is the story." "He never asks for sympathy, but his skill and the way he has told his story deserves respect. The Night of the Gun is an amazingly honest and fascinating memoir." "The Night of the Gun, is the fierce, funny, disturbing, brutally honest, and ultimately uplifting story of Carr's decent into a self-inflicted hell and a bumpy return to life. Part investigative page-turner, part redemption song, part meditation on the mercurial nature of memory, The Night of the Gun pulls a besmirched genre out of the gutter, drags it through rehab, and returns it to a respectable place in society. And, if there is any justice, a place on the best-seller list."